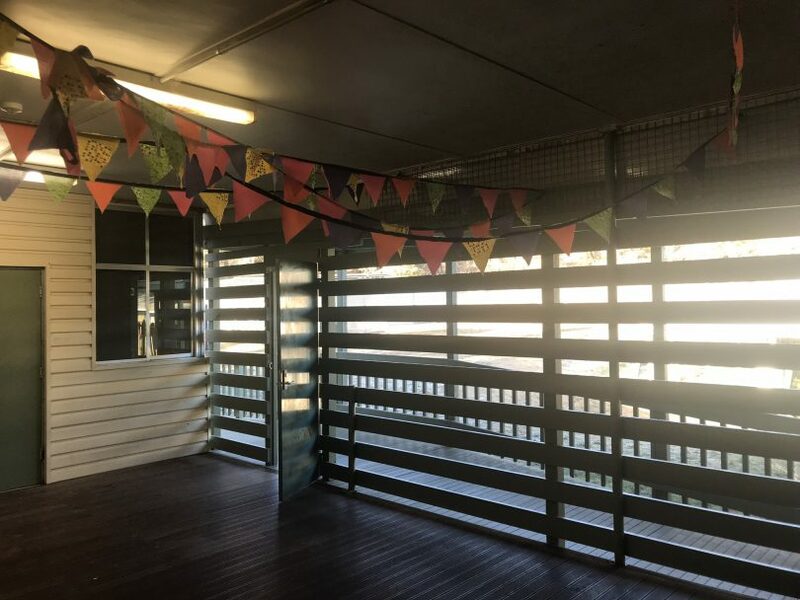 The veranda of the demountable set up for Woden School student Abdul-Ghani Ferkh. Photos: Supplied. 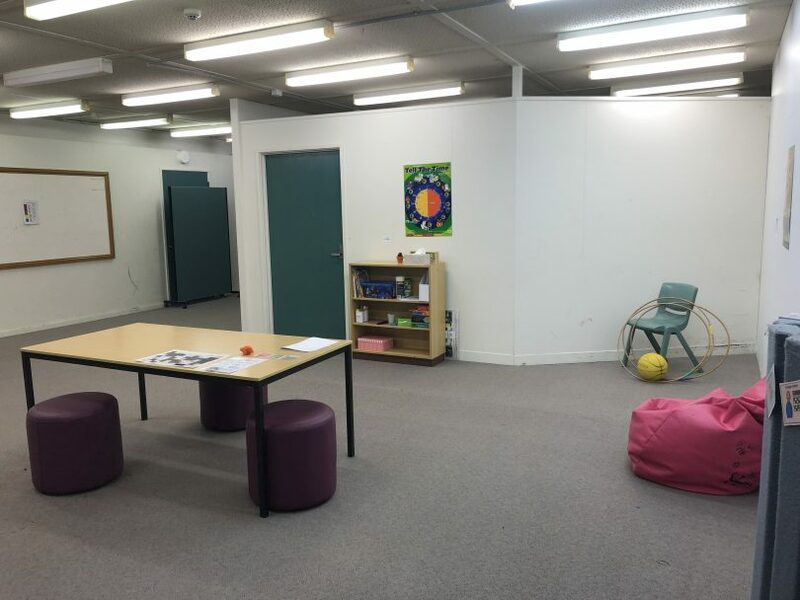 The ACT Government has released photographs of a restricted classroom at the Woden School for a boy with complex autism whose family has claimed it is like a jail or cage. Minister for Education Yvette Berry was forced to respond after the Canberra Times published a report that 18-year-old Abdul-Ghani Ferkh, who had been indefinitely suspended from the Woden School in April, had been invited back under strict new conditions, including not being able to interact with other students and some staff, and his movement limited to a fenced-off demountable classroom, only accessible through a side gate at the back of the campus. The report said that preparations detailed by staff in correspondence included boarding up the back rooms of the demountable and installing a floor-to-ceiling security gate along its veranda. Abdul had been suspended after running off the campus grounds to the local shops and stealing a toy, but his suspension was extended multiple times and then became indefinite. 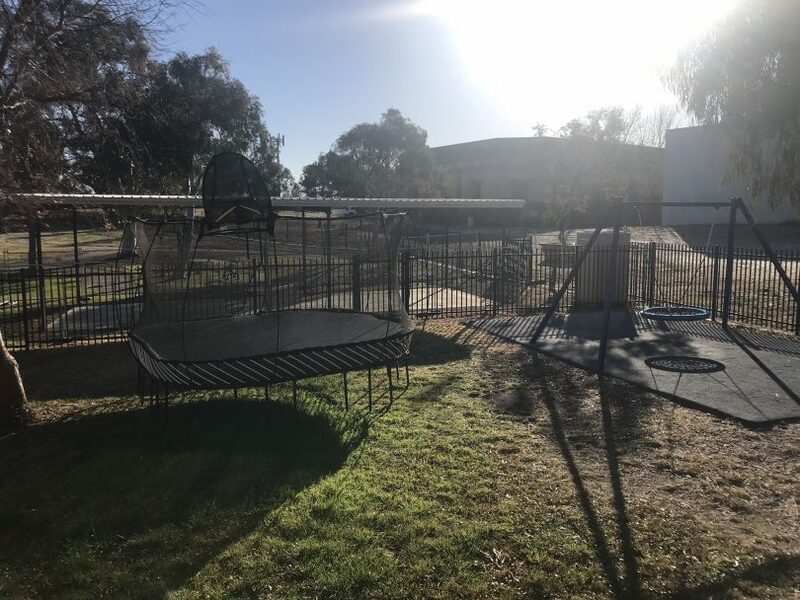 The Canberra Times reported that the school had said this was to allow time to prepare a secure environment for Abdul, who allegedly had also physically assaulted staff and damaged property. His mother Safaa Joumaa-Ferkh told the Canberra Times that her son had become very upset when he arrived at the new facility for his first day back on Thursday and was not himself when he returned home at noon. The Canberra Times said the doors were also locked as Abdul was still considered a flight risk, but the set-up was to be reviewed in two weeks, after which the school would consider allowing one or two of his peers to visit during recess. The playground at the rear of the demountable. Ms Berry said the Government would not discuss the individual circumstances of the case, which has echoes of the 2015 boy-in-the-cage controversy that led to an independent review into students with complex needs and challenging behaviours. “Our schools avoid restrictive practices wherever possible. In situations in which spaces like these may be used to protect the safety of an individual student, staff or others, careful judgments are made by our staff, informed by psychological and behavioural advice,” she said. “I have met with the school principal and seen the classroom in question. I have also discussed with him measures in place to support the family, staff, students and broader school community who may be affected. In July the Government appointed Mandy Donley as the ACT’s first Senior Practitioner to work closely with organisations across Canberra and the ACT community to provide education and to raise awareness about how to reduce and eliminate restrictive practices. It is believed Ms Donley was notified about the case on Thursday. The Government is undertaking special education reforms to reduce restrictive practices and increase inclusion in schools in the wake of the cage affair. If people are critical of this, which seemingly was put in place due to the student's violence, you must provide a better way, not just criticize this way. I read theses comments with concern. This 18 year old needs and will continue to need ongoing education for the rest of his life. He will move from Woden Special school into another structured environment to continue his education learning life skills as he is able. His carers and teachers need all the support they can get. Way to go in perpetuating the autism stigma to whoever thought up this half-baked idea. You can do better than this response Collette. What about some constructive ideas? Carol Drayson less ableist rhetoric perhaps? Do better yourself. Mum will probably be wanting him to have special treatment at a University next. At some point there needs to be some consideration given to the rights and safety of the many and if this is the way a special school, which has coped very well with many very difficult students in the past, has determined it needs to implement then so be it. Sadly, some people need restrictions for the safety of the remainder of the community and in a special school there are kids who are considerably more vulnerable than others. And why shouldn't we provide special treatment for people with learning difficulties. I guess we shouldn't allow any person with a disability to attend schools. I mean how dare we make it easier for them by allowing special circumstances. His rights? I can’t imagine the expense and additional resources going to this one child. I know plenty of teachers and I also know the all too familiar story of the parents with the most disruptive kids screaming the loudest for the school to fix their problems. You have to protect the teachers and other students and if that school is not equipped for this student, then so be it. Funding is what all schools lack. Not sure I agree with the statement 'Funding is what all schools lack.' I've visited some Independent schools that have Senior Common Rooms that are akin to Google Head Office, Art Studios that Practising Artists could only dream of, beautifully manicured sports fields and grand buildings funded by Alumni. Michelle Mills and they should, parents of private school children pay tax too. And if he hurts kids and teachers if course that doesn't matter at all. As I read it's a process. Just for peoples information. Woden School is not a Private school but a school devoted to children with learning difficulties. My neice went there and had a ridiculous 45 -60 minute convoluted public bus ride from Monash. I’m sure the school knows what they are doing. But an area exposed to outside temperatures and no sun does seem a bit weird to me. Surely the government should be funding something more adequate for Canberra weather. Why ? Private schools already pay enough out of their own pockets. That's a choice those parents make. Many families are not in a financial position to choose. Jennifer Jones. Private schools have parents that work and also pay tax. Usually at the higher tax rate. Puhleez. There is not enough money to go around and kids with learning disabilities are not getting adequate facilities. Where does the money come from? And, we all pay tax. Parents who send their children to private schools are taxpayers as well. So they are only using their own tax money. Melda Plenty sorry, tax money is by definition shared, you know, from each according to their ability, to each according to their need. We don't have our 'own' tax money. Please provide some suggestions rather than just criticize. Should they let him run free assaulting the kids and staff? My god. Looks like a pretty good space. The school has invested significant resources in providing this space. Agree Phil Ebbott its no just that 1 child safety. Given the other students have their own needs as well the school have done what is required for all the attend school in a safe way. It sounds as though the alternate would be no school. I would be grateful for the effort made. Our past experience is that Woden School was very special and provided a great educational and life learning setting. I believe that continues to today - I would encourage confidence in their approach to their students. It may seem harsh to some, however, it may have been in the best interests for all ie. the safety of the boy, the staff and other students. I’m an Early Childhood Educator and have been subjected to physical abuse from a 5 year old. An 18 year old would be even harder to deal with on a physical strength level. There’s isn’t a ‘one solution fixes everything’ as each child behaves differently and their triggers and responses are unique. Unless you’ve dealt with extreme cases first hand you honestly have no idea what it’s like. Bad behaviour is a form of communication. What is going on in this young man's life to bring about his outbursts? Something sinister is going on. Caging him is not the answer. Being a mother of a child with additional needs and one with children who don’t have additional needs and are able to cope very well in a mainstream school setting I think I have experience from both sides. I do have a child who has been violent at school and is disruptive in class due to his multiple disability I also have two children who have been been subjected to such violence from other children who are not coping in the school environment. What is needed is better resources, teachers been given more training and understanding of these additional needs, more learning support/teacher aides in place. And people to understand that all children deaserve a fair education they all should be giving the ability to interact with their peers and participate in school events and not to feel any different then they already do. Also more support to the parents who are dealing with this so they are able to parent to th best of their ability and not feel so worn down by it all that they feel that no matter where they turn there is no hope. I think there are to many kids with special needs in normal classrooms. They take up to much of the teachers time and make it hard for the other students. I can’t imagine how hard it is to be the parent of a child with special needs but in some cases the needs of the majority need to be looked after. The needs of the majority are always first priority. That’s the problem. As a generation we exclude people with disabilities all too often. Do you have any idea what it might feel like to already be a minority, and then be secluded from class mates on a daily basis??!? Kids are adaptable, “normal” kids even more so, they learn diversity while being in classrooms with special needs. yes some kids do have special needs. They need extra attention and care and time to learn at their own speed. The rest of the class shouldn’t have sit patiently while the teachers time and attention is taken up by one or two children over and over. I won’t go into the violence that can also come with some special needs children. My daughter has been the victim of that violence many times and that’s not right either. Kerry What? Would you prefer he uses the old terminology in order to not offend a fly? The spastic centre. Is that better? What else can they do? Have students and staff assaulted by this student? This student's perceived "rights" must be secondary to the safety of the school body. At 18, maybe it's time the student left school, then the mother won't have to worry about the "big cage"!